I haven't blogged in a while. Don't think that I have reached a rather feeble milestone and settled back to rest on my laurels. Oh no. The thing is, I haven't really had much to blog about. I've been plodding along with the novel re-write, adding about 800 words a day on average to the word count. Reasonable, steady progress I guess, but unremarkable. It feels good to have a routine of sorts, although in actual fact my daily output still varies from a couple of hundred words to a couple of thousand. I've just come out of a fairly heavy-going portion, which I've struggled with, and into a more exciting section that's got a lot more going on, some snappier dialogue and more movement. I definitely find this kind of thing easier to write. So, that's good. I've had a couple of pieces turned down, most recently by Vestal Review. This is a nice-looking market that I'd like to get a story into, but their rejection (although very polite and encouraging) confirms some of the doubts I have about my ability to write flash fiction - a form I still haven't entirely separated in my head from 'regular' short stories. A lot seem frustratingly incomplete, some have characters so slight I'm left wondering why anybody cares what happens to them. Some are excellent, and have stayed with me as indelibly as my favourite novels. I'll keep trying to write decent flashes, and keep reading them, in an effort to understand more about the form. 'All My Friends are Superheroes' by Andrew Kaufman - I bought this because I found it in a secondhand book shop near to where I live and thought the title rang a bell, although I can't remember where I'd heard about it. I've read it (it's very short) and it's one of the quirkiest, most charming stories I've read in a long time. It's basically a love story - Tom is a regular guy in a city where just about everybody else is a superhero. His new wife, The Perfectionist, has been hypnotised by her jealous ex, Hypno, into thinking that he is invisible. When he touches her, she flinches or hiccups, but she can't hear anything he says. Tom has the time it takes to fly to Vancouver to find a way of convincing her he is right next to her, as she is convinced he's left her. It's a clever idea and it's very well executed. 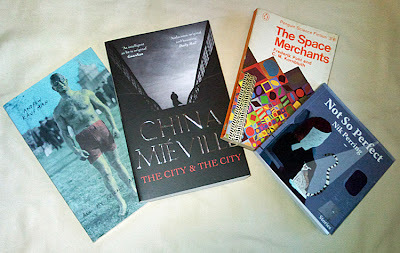 'The City & The City' by China Mieville - I've been meaning to read Mieville's work for a long time, and I decided that this would be a good place to start, seeing as it won this year's Arthur C Clarke award. That suggests it's a science fiction story, although I tracked it down in the Crime section of Waterstones. I get the impression it's the kind of story that's hard to classify, and I'm looking forward to reading it. 'The Space Merchants' by Frederick Pohl and C. M. Kornbluth - I don't know a lot about this, only that a friend of mine was talking about it one night (I'd never heard of it before), and the very next day I found it in a secondhand bookshop - not just on the shelf, but actually perched on top of a row of books as though it had been left out specifically for me to see. I can't resist coincidences like that, so I bought it. 'Not So Perfect' by Nik Perring - This ties in nicely with my aim of getting a better grasp on flash fiction, as Nik's stories are regarded as fine examples of the form. Plus, he seems like a very nice bloke, and it's always good to support an up-and-coming authors whenever you can. I so envy your 'unremarkable' output. I'm putting 'All my friends are superheroes' on my to-read list. In the latest Mslexia comp/prize listings I've circled 'The Aeon Award' and written 'Dan?' next to it - it's for short fiction (up to 8000 words) in any speculative genre. I'm not sure if that's even appropriate to you but for some reason my head linked the prize with you. So if you haven't got any long fantasy, SF or horror stories it MUST BE a sign that you should write one and enter. You'll love "All My Friends Are Superheroes". I think. I'll bring it with me in November if you like. I didn't realise Mslexia did a competition round-up as well. I've leapt onto a very crowded bandwagon, it seems. I'm planning to re-jig one of my SF stories and send it to Aeon, but I keep putting it off, so thanks for the friendly shove in that direction. I could really do with getting some short SF stuff into print if I'm ever going to get an agent/publisher to look at my novel (assuming I finish it at some point).